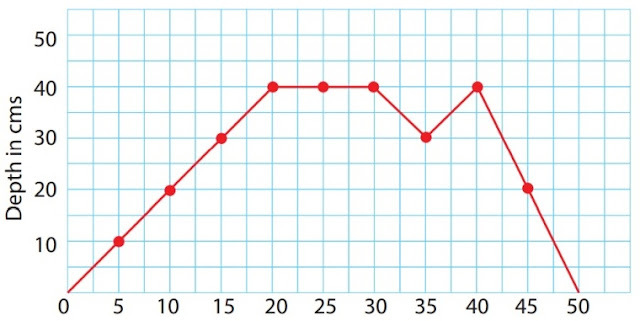 Make up a story that fits the graph above. It could be how many minutes it takes for a builder to dig a hole at a building site. Yes, now tell me a story about the graph. It could be how long it took to build a house. Look at the Y axis Aaliyah. Could this information really be about house building? This could be how many hours there are on a it would take to build a big mountain or a castle. But the Y axis shows depth in cm. What does depth mean? It could be about how long it took you to keep you head under water so for the first one she/he went under for five seconds and the on the side is about were she/he is. On the beach a boy named kermarley was measureing 9 coconut trees the first one was 5 feet tall the second one was 20 feat tall the 3rd one was 30 feat tall and the 4th , 5th and sixth was 40 meters TALL seventh was 30 meters just like the 3rd one and ,8 was 40 and the last was 9 it was 20 feat tall now that he was finish measureing he wanted to add all of them up for a total 10+20+ 30 +40 + 40+ 40+ 30+40 +20=130. it gould be I mountain that someone is kliming. It shows depth in cm. Could this really be about climbing mountains and why not? it could be when a person setting of a rocket and it go to that directions because when you set a rocket up it go up and then fall down after a bit because when it go up or maybe it show when the rocket pop and the second show how long it took but i think it something about rockets or it could be when we put alker seltzer in the rocket it fly or it could be when a bird fly in the directions fall down a the end or it could be when you have a map and does not show no more were you have to go or it could show you to a beach were people are setting rocket so they could send people to help they people in the beach then people in the beach migth sell there rocket so they could be rich and live a happy life or maybe when they set rocket for there firework to show everybody it a new year everybody buy thing for sale or it could be when you go inside the rocket and fly off and see how far you went or maybe when you teach a person how to rocket and go far in it pop like fireworks.